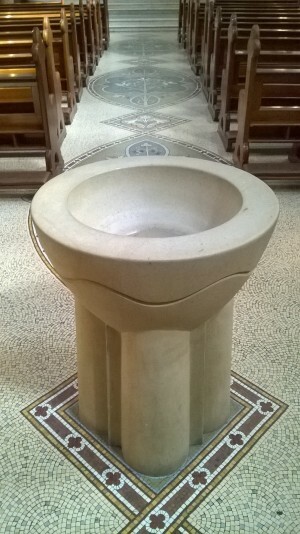 Baptisms take place on the second and fourth Sunday of each month immediately after the 1.15 pm Mass. To book a christening, contact the parish office, telephone 028 9064 2446. 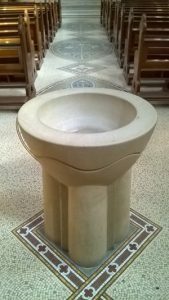 To arrange your child’s baptism, you need to contact the parish office one month in advance. The secretary will book a convenient date and will pass on your name and contact information to Sister Jacinta who is responsible for the preparation for this important sacrament. To welcome your baby into our parish community, Sister Jacinta will contact you and arrange to visit you at home about a week before the baptism. During the visit, she will explain the symbols of the ceremony, give you a parents’ booklet to help you prepare for this important family event and answer any questions you may have. Sponsors are often referred to as the child’s “godmother” or “godfather”. The sponsor accepts the responsibility of helping the person grow in the Catholic Faith. They must be at least 16 years old and must have a lifestyle that demonstrates their faith is strong enough to fulfil the responsibilities involved in being a sponsor. The child may have only one godmother and one godfather. Another person involved becomes a witness.